Three weeks ago, I got a really awesome email (Yea, I know I’m really behind in posting about this). Like any typical morning, I glanced at all my new email in my inbox and in one swift swoop, selected all the ones I knew were trash and hit delete. Then I went through and read the rest of my emails. This was my reaction, all in thirty seconds: Sharon? Me? I did enter the sweepstake for Third Day Natural Soaps. No… I went through my emails, I didn’t see anything from Frugal Girl. OMG, did I delete it thinking it was spam? No, I wouldn’t have. SPAM FOLDER. Lemme check. There it is!!! OMG, I WON!! YAY!!!! Good thing, as my morning email routine, I would check my inbox and read my emails, before hitting ‘Delete All’ for my spam folder. 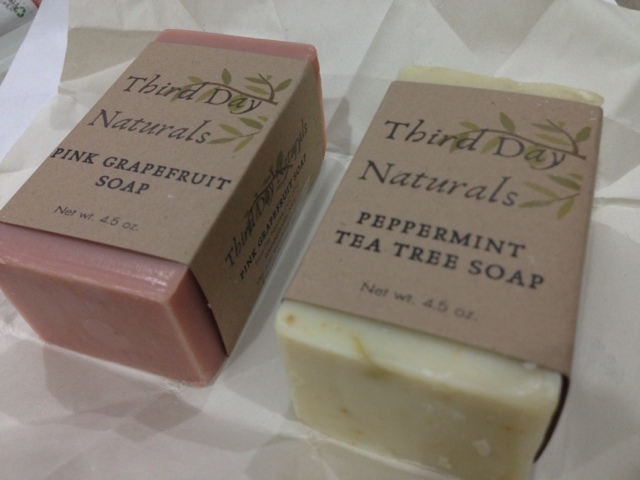 I got to choose two scented soaps from Third Day Natural for winning the sweepstake. How perfect is that right? KT and I love collecting handmade natural bar soaps. I selected Pink Grapefruit and Peppermint Tea Tree. These soaps are so fragrant that I was able to smell it through the paper wrapper and distinguish which soap was which. They smell so good.